Raymond Lesniak celebrates at a news conference before the start of sports gambling in New Jersey. I almost didn’t get to place a bet that ended up winning me $100. I had gone to Delaware for the start of sports gambling there last week, and won a $100 bet on the Rockies. I figured I’d test my luck again. For the start of sports gambling in New Jersey—which began at two sites on Thursday—I wanted to bet on Russia to win its first World Cup game. My colleague Billy Haisley wrote that Russia’s opponent, Saudi Arabia, was the worst team at the World Cup. Plus I figured, if all else failed, they’d figure out a way to rig it so that the home team won its first game. I was right! Russia thrashed Saudi Arabia, 5-0, and I won $100. The game was not close. But my bet ($150 on Russia -1 at -145, winning me $103.45) almost didn’t make it. New Jersey Gov. Phil Murphy placed the first legal sports bets in New Jersey (the Devils to win the Stanley Cup, Germany to win the World Cup) at 10:30 a.m. But the lines at Monmouth Park were so long that many people weren’t able to place a bet on that first World Cup game. Just as I walked away with my ticket, the odds came off the board. The game had started. Someone did! The NBA, NFL, NHL, MLB and NCAA sued to block the law, saying it violated the Professional and Amateur Sports Protection Act of 1992. New Jersey kept losing in court. When the Supreme Court declined to hear its appeal, legal sports gambling seemed dead. It wasn’t. To try to get around PAPSA, Lesniak and others introduced a new bill that completely eliminated state regulations around sports gambling. If the state couldn’t legally regulate sports gambling, fine; New Jersey would simply let the casinos offer it without state regulation. This law did not do any better in the courts. New Jersey lost two more times. But the Supreme Court decided to hear the case, and ruled earlier this year that PAPSA violated the constitution. Lesniak is no longer in the state senate—he failed at his run for governor last year—but others took up his cause and introduced a new sports betting bill just after the ruling. Gov. Murphy signed it Monday. The bill that passed is, obviously, weird in its own ways. It bans casino owners who also own pro sports teams from taking bets, then creates exemptions that render the provision nearly toothless. The Borgata, owned by MGM, can take bets even though MGM also owns the WNBA’s Las Vegas Aces. Josh Harris, who has a stake in Caesars Entertainment, owns the Sixers and Devils but has an exemption allowing the three Caesars casinos in A.C. to take sports bets. Only the Golden Nugget, owned by Houston Rockets owner Tilman Fertitta, is in a bind: It won’t be able to take NBA bets. The law also has some quirks. Though you can gamble on the field to win the next season’s college football championship, you won’t be able to cash if Rutgers actually wins the whole thing. A note at the bottom of the odds sheet tells bettors: “IF ANY TEAM LOCATED IN NEW JERSEY WINS THE CHAMPIONSHIP, THE RUNNER-UP WILL BE DEEMED THE WINNER FOR WAGERING PURPOSES.” Who knows what the bookmakers will do if NJIT and Seton Hall meet in the NCAA basketball championship game next year. When it became clear the Supreme Court would likely overturn PAPSA, Asher got his people to work, adding additional sports betting terminals—and some giant screens—in the grandstand. The crowd was subdued for the first live event, the Russia–Saudi Arabia World Cup match, perhaps because not everyone got their bets in on time. But there were some cries of joy and of sadness when Russia got its third goal (when the over of 2½ was reached). That guy who tweets in all caps was there, just like in Delaware, screaming at the top of his lungs and placing a $5,000 bet on the White Sox. They lost, 5-2; he said he also lost $4,000 in Delaware. He sells picks, too, if you’d like to share in that success. The Borgata sports book seems thrown together. TVs with betting odds on the walls look hastily installed. It’s just the old horse race book—but with three sports gambling terminals. There are some chairs for gamblers to sit at, but yesterday they were all taken up by the race book regulars. The Borgata race book is fine—it has to be the fanciest off-track betting parlor I’ve ever been to—but it’s still an OTB that’s set up for horse wagering. A security guard told me it wasn’t as crowded as he expected it to be. There is one change: Starting Monday, smoking will be banned at the sports book. An OTB without smoking! Football is the big sports gambling moneymaker, and by football season all the Atlantic City casinos will likely have a room like Monmouth Park does: A big sports bar where you can place bets. Casinos are tight-lipped, but some of them appear to be planning just that. The Press of Atlantic City reports the Borgata is working on a new sports book area. The Ocean Resort Casino, the former Revel opening at the end of the month, plans a sports book in the center of the gaming floor. That will also be run by William Hill. Don’t expect sports gambling to change New Jersey’s finances. “Obviously the specific revenue associated with sports betting is going to be significant and growing, but it’s going to have a knock-on impact,” Gov. Murphy told reporters at Borgata (he stopped there after Monmouth). Sports gambling revenue makes up just two percent of Las Vegas casino revenue; slot machines are king. But sports gambling will be a way to get people in the door. 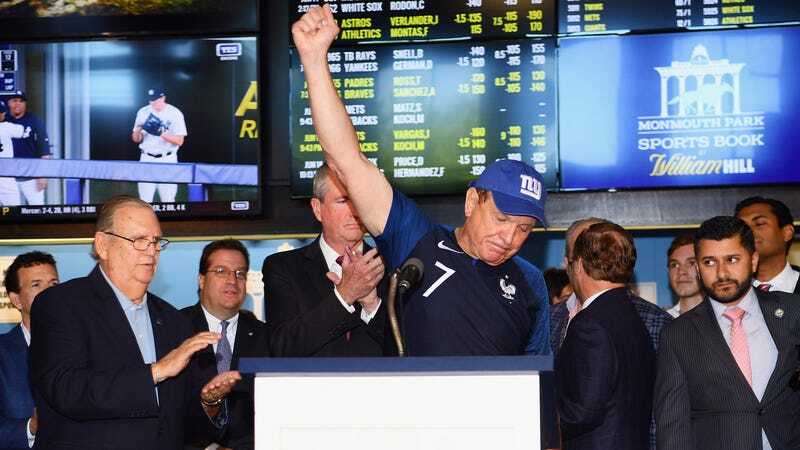 Legal sports gambling has kicked off in New Jersey with two locations. It will expand. And this fall, you’ll probably be able to sit at a sports bar near the ocean and drink beers while you watch your favorite football team cost you money.